Alan,, You Have Clearly Stated What The Majority of These Z-jews are Suffering With Unto Death ! For I see no Cure, nor Remedy for This Paranoia that afflicts So many Who Can`t `see the "Forest for The Trees' And Why this Affliction is Soon Going to Turn So inward On The jews ..to The Point It is Going to Finish them All OFF... And They, Being So Paranoid, They will not even Feel a Thing. They Will NOT even Be able To See IT Coming. Paranoia blinds the Senses That Spell Sanity. Of course, all Israel-supporting Jews are complicit. Every American synagogue flying the Mogen David flag or Israel is complicit and they need to be told so in no uncertain terms. Perhaps activists should march around these synagogues with pictures of what their support has done to another people, the myriad crimes of Zionism. Zionism is nothing but power, a gangster imperialism for people who think themselves better than others. It is that simply. Has nothing to do with Judaism, of course. Zionism has demonstrated the power of lies. Every Israeli is complicit as well, even the "peace" groups and "human rights" groups. They are part of the system and therefore they live on the system, at the behest of the system, and therefore they are responsible for that system. 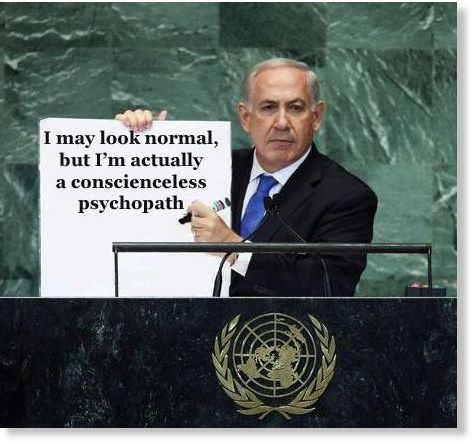 It would be terribly wrong and a horrible thing altogether, but should some power obliterate all of Israel and every Israeli, personally I would lose no sleep over it. And I'm Jewish. Ontogram, You Summed up how you feel..And Why Quite Well. YES, it is a Terrible point to Come to.. When YOU See The Effects of Destruction That has Been Wrought By your Own ''Kindreds.'' I Get THAT. I am So Ashamed Any nmore to Even SAY I am an American Citizen...For When I Can See The Destructiveness and The Pain This Country Is Reining down on Poor, Defenseless Peoples All over This Universe ( And For NO More reason but that They are inhabiting A Land that Has Something in it..Or On it..That Is Coveted...It makes ME Ill. My sadness Is derived From my own inability to Still This Tide of Destruction...Only God can Make IT STOP. And HE Will. SO..Ontogram, don`t hate yourself because you are Jewish. Just Hate What So many Creatures who Say they are jewish,,Is Doing..in YOUR name. When enough People like yourself Feels AS you DO..And Speaks OUT as Clearly >>You can Bet..Times Will Change. IT IS an Inevitable Fact It will Have to Breathe Its` last. God Bless YOU for Speaking out.